Americans dislike soccer and here is why. The teams don't score enough: We need non-stop, in your face, Michael Bay action or we immediately lose interest. There aren't any "star" players: We come for the game but we stay for Dennis Rodman in a tutu. They are foreigners: Eh! It's like they are from Canada or something? We don't understand the rules: The last time I got "carded" was at a bar. Soccer is already a world wide sensation and here is why: All you really need to play soccer is a ball. Most countries that excel at soccer are very poor nations so naturally their youth cannot afford all the gear and "ice time" associated with hockey. Nobody owns a basketball hoop. Gear issue again for U.S. style football. Someone needs to own a huge net for volley ball and once AGAIN gear issue for baseball. These are the sports of wealthier nations and that's ok. 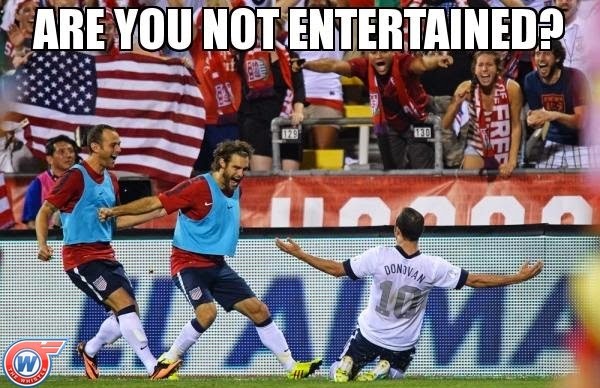 But, soccer isn't going away so how can we, as Americans, learn to appreciate this sport? No star players you say? Not enough drama? I beg to differ. In American sports we get caught up with the players' wives and families or their illegal dog fighting rings. Just tune in to the BBC every now and then to check up on the latest soccer player that was KILLED for not playing well. I wish I made that last part up but sadly that is true. If that isn't enough drama for you; you should probably seek medical attention for your blood thirst addiction. They are foreigners. Well, you could start watching soccer and investing in the U.S. team and then there would be less foreigners. Maybe this is why the rest of the world doesn't like U.S. football? They are all at home just thinking, "Meh, foreigners." MIND BLOWN. We don't understand the rules. I can't really expound upon this because I barely understand the rules of a relay race. Ball in net = GOOOOAAAL! Ball on field= sometime soon there will be a GOOOAAL! I hope this helps, coming from someone who does not watch or care about sports.